If you keep your water softener or filter in the basement of an occupied home, you normally don’t need to worry about winterizing it. However, if the softener or filter is an unheated garage, a vacation home that’s closed down for the winter, or a home that’s going to be left vacant during an extended winter vacation, you need to take precautions against freezing. 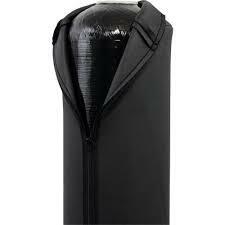 Insulating jacket for softener or filter tank. The tall tank needs protection from freezing; the shorter brine tank, probably not. Some homeowners build an insulated box around the main media tank. You can also purchase plumbing insulation in sheets, or wrap an insulation blanket around the tank. There are even special jackets designed for water softener and filter tanks, or water heat insulation jackets can be modified to do the job. Because of the salt saturation, your softener’s brine tank is only likely to freeze in very cold climates where temperatures stay above zero. After all, it has to get really cold for the ocean to freeze. If you are using your water softener year round, the most important thing is to keep it warm enough to prevent freezing, which is why a space heater in your garage or an other unheated space can help. Remember, you only need to keep the temperature above 32 degrees Fahrenheit. Running water will also prevent freezing. If you are only going to be away for a few days, you could leave a faucet running at a slow trickle to keep things moving in the pipes. Although not a cure-all, this will at times prevent hard freezing and bursting from freezing pipes. It is recommended that you drain the tanks. If there’s no water in the tanks, they can’t freeze. Probably the easiest way to do this is to put the softener or filter into bypass mode to isolate it from your house plumbing, then disconnect the it physically from the bypass valve so that the control valve can be screwed off the top of the tank. With the riser exposed, you can use a 3/8″ tube inserted into the open riser to siphon the water out of the tank. You should be able to get almost all the water out of the tank. Although the water in the brine tank probably won’t freeze, it’s a good idea to dip out most of the water that isn’t actually covered by salt. 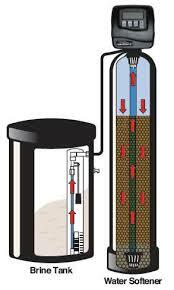 With all the water out of the tank, the filter or softener may actually be light enough to move to a warmer area. If it’s too heavy, leave it: it should be safe. People with remove cabins who shut down seasonally might find it worthwhile to invest in a softener or filter built in a special “bottom drain” tank that makes the job of winterizing easy. These tanks can be drained completely without removal of the control valve or going to the trouble of siphoning.